Amazon Prime Delivery: Would You Trust the Mailman Inside Your Home? HomeConsumerAmazon Prime Delivery: Would You Trust the Mailman Inside Your Home? Are you an Amazon Prime member? Get to know more about the potential of having an in-home delivery option through the August smart lock and Garageio garage door openers. People are becoming more and more conscious about their security, and delivery guys are not always exactly the type you can easily trust unless you already know them. Amazon.com, Inc. (NASDAQ:AMZN) Prime members, who make up the largest population of Amazon subscribers, are left with the question: Would you allow your mailman to get inside your home when you are not there? According to a report released by Fortune in early July, there are currently more than 63 million Amazon Prime members in the US alone, who tend to order a lot of stuff online. The same report suggests that Amazon Prime members outnumbered the non-members as customers. The former spends about an average of $1,200 in 2015, while the latter spent an average of $500. Since Amazon Prime members make a lot of purchases (and deliveries), there is a great potential that Amazon may give them the privilege to choose whether or not to allow the mailman to have access to their homes while they are away. Amazon has existing ties with two smart home lock companies August and Garageio. August is a smartphone-controlled lock company that works like a virtual key. Users can lock and unlock their doors using a smartphone, as well as allow certain people to get into their house without an actually key while they are away. Also, there is a “log-book” to keep track of who and when certain people get into the house. A feature that makes in-home deliveries secure and possible is the one-time access code. Delivery men are given a code that they can use to open the door, but it can’t be used again the next time around. Meanwhile, Garageio is a connected garage door opener startup. Amazon Prime members can potentially have the option to give mailmen a temporary access to their garage doors. 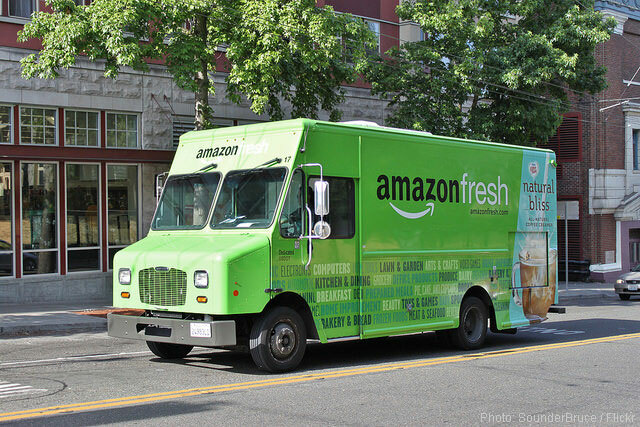 An unidentified retail company in Seattle conducted a test of August locks where shoppers are given the in-home delivery option upon checkout. If the shopper gives it a go, the delivery service will be issued a one-time access code. The delivery personnel uses the code to access the front door or garage door, leave the package safe inside the property, and close the door. The main benefit of this feature is to keep the packages protected from the weather and thieves. During the test, the goods were reportedly delivered as is, without the external protective packaging that a regular delivery package usually comes with. When the goods are protected from the weather, there is no need to use an external box especially if the items such as books, computers, or apparels already have their own packaging. Aside from protecting goods from weather conditions and thieves, the retail companies would also cut the cost of packaging. Amazon continues to give excellent customer service, particularly by providing fast delivery that is free if you are a prime member. According to a report by TechCrunch, not a lot of homes have August smart locks, and Garageio garage door openers are not yet that popular. However, the possibility of having an in-home delivery option can drive more sales for Amazon and the companies producing the said smart devices. 1 Comment on Amazon Prime Delivery: Would You Trust the Mailman Inside Your Home? You keep using the word “Mailman”. Try using “Letter Carrier” as the Postal Service employs many women who deliver mail. Yes, I would trust a letter carrier.